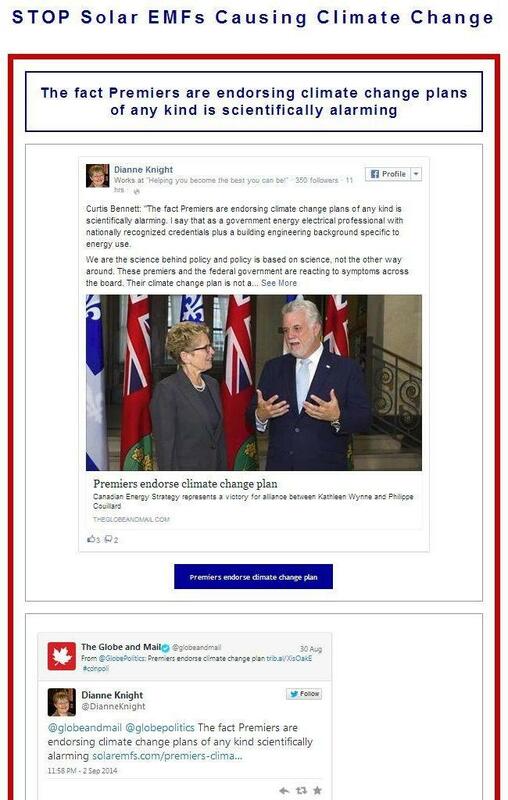 Poster on Facebook: "The fact Premiers are endorsing climate change plans of any kind is scientifically alarming"
"BRINGING THE INVISIBLE TO LIGHT SINCE 1979"
Copyright © 2014 Thermoguy. All rights reserved. Web site Developed by Dianne Knight. Educational and Informational Purposes: All information on this site and all links that are linked to from SolarEMFs.com represent solely the opinions of their producers. SolarEMFs.com is not in the business of persuading you or anyone else to believe anything that that is presented linked to from this site; however, it does encourage you to use all available resources to form your own judgement about very important things that affect your life.